Windwalker Boats is a small shop specializing in small sailing craft. Our range is in the “up to 25 feet” category with the majority of our boats in the 7 to 20 foot range. We utilize the West System epoxies for our composite projects with over 28 years of experience with the material. Our rule of thumb is not to use wood over 2 inches in thickness without laminating it from smaller stock. Every effort is made to utilize native area woods in our boats and repairs. It is our feeling that composite or encapsulated boats give the owner the enjoyment and feel of a natural wood while minimizing the maintenance of a wood boat. We also do repair and restoration work and have storage for the winter months. “Le Demier” on the building horse. 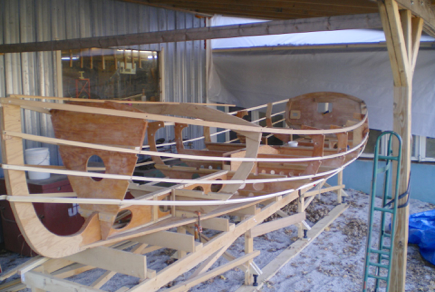 17 plus foot ketch under construction.The Boat is a modified version of John Welsford’s Pathfinder. Scheduled for May Launch.